I went to a new place called McFaul's Ironhorse Tavern in Parkville. McFaul's used to be another restaurant were my dad used to work at, and hearing that it was turning into another restaurant made me want to go there. When I got my first look at the place, it looked pretty much the same when I drove past it before, but then I realized that there were lots of lights and music on the balcony (which, honestly, I've never noticed before). When I got in, I saw that it looked very fancy for a place with an outdoor bar. When we got seated, I saw they also had TVs in just about every part of the restaurant, but ours was turned off. On the menu they had items like Fish of the Day, Shepard Pie, and McFaul's Crab Cake Sandwich. They also had a kids menu, which had items like Hot Dog, Fish and Chips, and a Burger. I got a Pork BBQ Sandwich, since I love them, my mom got Salmon BLT, and my dad got a Cheeseburger, since some of the rest of the items were expensive. While we waited for the food to come, I drew on the mat and the table, since you can draw on it, and got to see the balcony. When our food came, I saw that my sandwich came with a side of coleslaw, but since I don't like coleslaw, I gave it to my mom instead. My Pork BBQ Sandwich tasted delicious! It was juicy, moist, and had lots of BBQ sauce on it, since it came on the side and I got to put it on. It also came with homemade potato chips, which were good. They were crunchy, and had Old Bay on them, but weren't very salty, like I like them. We were going to have their Black Bottom Cheesecake, but the waitress told us that the kitchen closed at 9:30! I give McFaul's *** 1/2 stars for food and *** 1/2 stars for kid friendliness. The reason I gave 3 1/2 stars for both is because the kids menu was very expensive and they didn't tell us that the kitchen closed or when it closed. I really wish I could have tried their Black Bottom Cheesecake. Well, that's all. Bye! I went to a place called Mooyah during my adventure in Virginia, which reminded me of a Five Guys or Z'Burger. The place was pretty hidden, since they had their sign out in front of another restaurant, but eventually we found it. When I got in, I saw TV's, pictures of cows, and a humungous chalkboard inside. To order, you had to fill out a piece of paper that they gave you by coloring in the circles next to the items that you wanted to order. 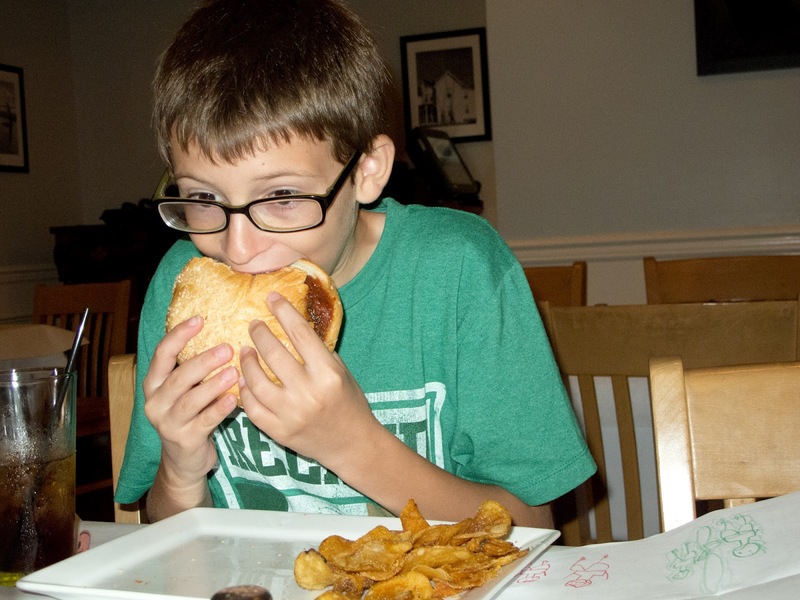 Some of the items on the menu were a Mooyah Burger, Little Mooyah Burger, and French Fries. The kids menu consisted of a Little Mooburger, Hot Dog, Grilled Cheese, and Chicken Strips. They also had lots of shakes, like a Caramel Shake, a Mint Chocolate Chip Shake, a M&M's shake, and even a Butterfinger Shake! I ordered a Little Mooyah Burger with American Cheese and Bacon, a Snicker's Shake and a side of some Mooyah Fries. While I waited, I watched TV. My shake came first and it tasted awesome! It had real Snicker's pieces in it, it was really creamy, and it was chocolaty! I also tried my brother's Mint Chocolate Chip, but they forgot the chocolate, so they had to take it back and remake it. My Little Mooyah Burger was delicious! The bacon was crunchy, the cheese was cheesy, and the burger tasted juicy. The fries, though, were just okay. The weren't very salty like I like them, and they were pretty plain. I give **** stars for kid friendly and ***1/2 stars for food. Before I left, I put "The Koodie Was Here" with a smiley faced person wearing glasses, and to finish it of, I wrote "MOOYAH!" below it. Also, I heard that they maybe opening up another Mooyah place up in Washington D.C, so all you folks in or near Washington D.C should go because I think it is delicious! Well, that's all. Bye, and Mooyah! My dad took me to Lost in the 50's Diner after we went to the plumbing store for a snack. When I walked in, I noticed that it wasn't very crowded, yet it was a pretty cool diner. You get to see how they make their fries and cook their burgers at the counter. They also had a TV, which had the Olympics on when we were there. They have things like Burgers, Turkey Club and BLT Sandwiches, and breakfast all day, including French Toast and Cheesy Eggs. They also had a kids menu, which had items like Grilled Cheese, Chicken Tenders, and PB&J. My dad, brother, Owen, and I shared Bacon and Cheese Fries. 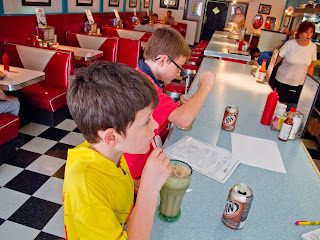 For our drink, Owen and I got chocolate root beer floats. It was delicious! It was super chocolaty, and they also gave you A&W root beer in a can with the float, in case you run out of root beer. When we got the fries, they too were delicious. They make the cheese sauce homemade and the bacon was all chopped up into little pieces mixed in with the fries. I give ***** stars for food and ***** stars for kid friendly. I'm probably going to go back there for either dinner or breakfast, and I can't wait until then! Well, that's all. Bye! 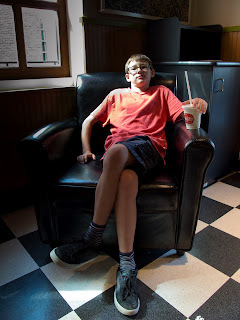 "10 Most Famous Kid Critics and Cooks"
Two years ago, Eli Knauer created his blog, "Adventures of a Koodie," as a first step to fulfilling his ambition of becoming a food writer. Today, 11-year-old Knauer has written more than 100 reviews, from chain restaurants such as Texas Roadhouse to chef Bryan Voltaggio’s Family Meal. Using an impressive vocabulary, Knauer reviews the food, as well as the kid-friendly atmosphere of each restaurant. In order to receive all five stars in a rating, a restaurant would have to ensure a child’s entertainment, providing items such as televisions showing kid-friendly programming. Another restaurant that I visited with my grandma was a place called Cheddar's. It's a chain restaurant that just opened in Pennsylvania. When I got there, the first 2 things I noticed about it was that they had a very big, unusual looking fan in one of the rooms, and that they had a big fish tank that was in the middle of 2 rooms. It took a while for us to get seated, since they were so crowded. When I looked at the menu they had a lot of items, such as their Fish Taco, Shepard Pie, World Class Chicken Sandwich, Crispy Chicken Salad, and Pasta. They also had a kid's menu with a Grilled Cheese Sandwich, Grilled Chicken Breast w/ Veggies, and a Junior Burger. I wanted to get the Grown-up Grilled Cheese, which had slow roasted beef and four slices of cheddar and American cheese with grilled bread. But, my mom ordered me the Monte Dogs from the kids menu, which was like a regular corn dog, only it had a special batter, served with fries. My brother had the Chicken Tenders from the kid's menu, and my grandma had the Tortilla Soup with a salad. My sister got a Grilled Cheese Sandwich with edamame, my dad got Chicken and Waffles, and my mom got Chicken Tenders. As we waited, we had some Onion Rings, which were delicious! They were probably the best onion rings I've ever had! After that, though, there wasn't much to do. It took a long time to get our food, but that was only because they were very crowded. Though when our food came, the only one who didn't have something was my grandma. They forgot to bring her Tortilla Soup and her salad should have come earlier or at the same time as our food. My Monte Dogs were really good. The batter was delicious, but the hot dog tasted like a hot dog you would normally get from packaged corn dogs. 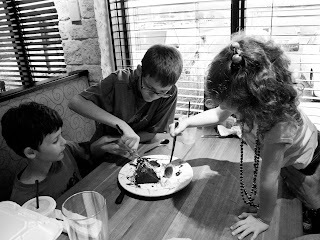 After I finished, my grandma and papap got me the chocolate cake to split with my brother, Owen, and my sister, Olivia. It was so big and it tasted fabulous! It was super chocolaty, and the cake kind of tasted like a hot lava cake. 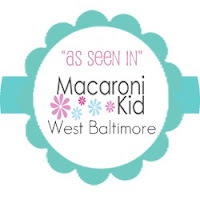 I give **** stars for food and ** 1/2 stars for kid friendly. I would love to go there again, especially since my mom ordered the wrong thing. Well, that's all. Bye! I went to a place called Sons of Sicily Pizzeria and Grill in Pennsylvania with my Grandma and Papap. When I got there, I noticed that they had a Television with the Olympic try outs on. I also noticed that they had candy machines where you put in either 25 or 50 cents in and out comes either a piece of candy or a prize. On the menu they had items like their Fish Sub, Chef Salad, Italian Sub, and BBQ Chicken Pizza. They also had a kids menu, which has items like their Slice of Cheese Pizza, Fish Sandwich w/ French Fries, and Spaghetti w/ Meatballs. My Papap and I both had a small Ham, Salami, Sauce, and Cheese Stromboli, while my Grandma, Owen, and Olivia had a Cheese Pizza. While we waited, we had Mozzarella Sticks as a appetizer. They were delicious! The cheese was really gooey and cheesy, and the batter around it went perfectly with the Mozzarella. When I got my Stromboli, it was HUGE, even though I ordered a small. The small Stromboli was 1ft long! The Stromboli was fantastic! The cheese was gooey, the ham and salami were really juicy, and the sauce that came with it fit perfectly with the it. I give ***** stars for kid friendly and ***** stars for food. Well, that's all. Bye! My grandma asked me if I could do some reviews about some restaurants around her area in Pennsylvania, which I agreed to do. The first place I went to was a place called Jim Mack's Ice Cream. It's not just a restaurant, but a miniature golf course and a petting zoo, all in one! They also had a bounce house, a basketball court, and even a arcade! On the menu they had things like Hamburgers, Cheeseburgers, and Grilled Cheese. My brother and I shared 2 Hot Dogs (we both ate one) while my sister, Olivia, had a Grilled Cheese. While we were waiting, we decided to play in the bounce house, which was lots of fun. Though when our number was called, we had to rush out to get our food. The Hot Dog was delicious! It was juicy, cooked just right, and the bun was perfect. 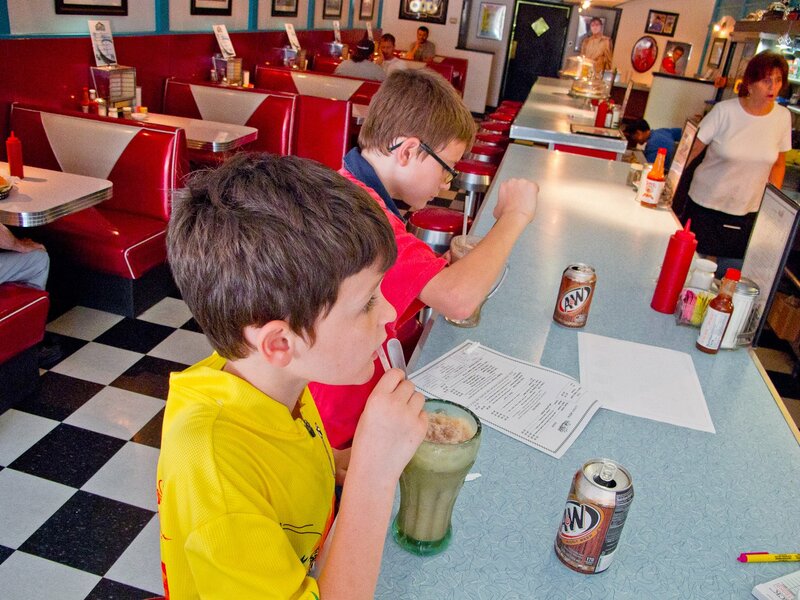 After that, I got to try their famous Thick Chocolate Malt Shake. It was amazing! It was chocolaty, very thick, creamy, and cold. After we ate, we got to see and feed a real live bear! I also got to see llamas, ducks, a rabbit, and even these fluffy chickens on the golf course! The putting greens on their golf course were very interesting, including their Well one, their Ferris Wheel one, and even a Loop one! I give ***** stars for kid friendly and ***** stars for food. I would love to go to this place again, and hopefully I will! Well, that's all. Bye!